Don't forget your coffee before taking this quiz. Coffee’s origins are often attributed to a goatherd who noticed the way his animals reacted to their consumption of particular berries. The region in which this supposedly occurred is called Kaffa. In what modern-day country is it located? Nearly all of the world’s coffee production is done with two species of the coffee plant. Coffea canephora, commonly referred to as Robusta coffee, is about 20% of production, while the vast majority is done with what other Coffea species? 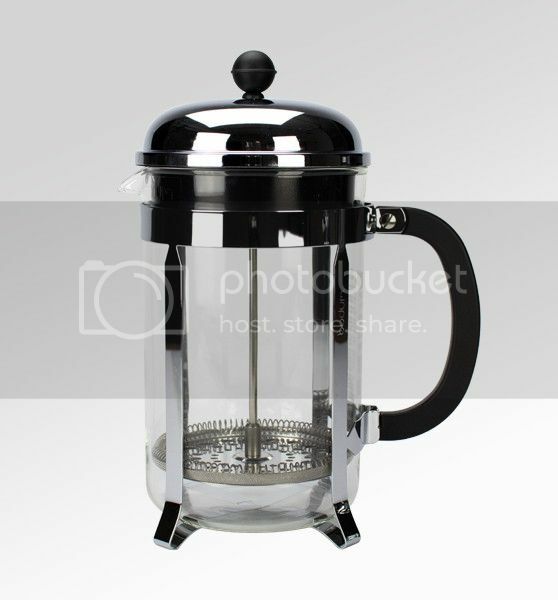 What method of coffee preparation is conducted using the device pictured? Distinguished from other common latte-style drinks by usually being served layered instead of mixed, what coffee beverage’s name comes from an Italian word meaning “stained” or “marked”? Founded in 1966 in Berkeley, this chain has locations in nine states (plus DC), most in its home state of California – a far cry from the success of Starbucks, whose founders were actually trained and briefly supplied by the founder of this chain. What popular dessert typically involves ladyfingers soaked in coffee and then layered with a mixture that includes mascarpone cheese? Kopi Luwak, one of the most expensive coffee varieties in the world, is notoriously made from beans that have been eaten, partially digested, and then defecated by a species of what cat-like animal? Finished in 1869, it stood at the corner of Fourth Avenue North and Church Street until it was destroyed by fire on Christmas night 1961. What was this Nashville hotel, whose special blend of coffee was supposedly once praised by Theodore Roosevelt as being good to the last drop? On January 6, 2015, Starbucks in the United States started selling what specific beverage, originating in Australia and New Zealand, that consists of one or two shots of espresso with a small amount of microfoam poured over the top? “Bulletproof Coffee” is a trendy recipe that is supposed to generate better mental performance. Although there is a complex recipe that involves specialized beans and something called “Brain Octane Oil,” the beverage is usually defined by the addition to coffee of what food product? A broken coffee mug made of Kobayashi-brand porcelain figures prominently in the climax of what 1995 film? English words derived from the Nahuatl language include avocado, coyote, and what proper noun, the brand name of a product first made in 1936?